Recognized for superb spreadability and workability. The smooth, creamy formula is easy-to-apply and sand resulting in a virtually pinhole-free surface. Tack and clog-free. 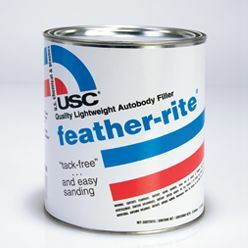 Use for filling and repair of minor body work up to 1/4" deep, such as dents, dings, hail damage and small holes. Can be used on steel, aluminum, fiberglass, wood, other body fillers, 2K primers, aged and sanded OEM topcoats and SMC for cosmetic repairs, and galvanized and other zinc-treated steel. May be topcoated with finishing glaze/putty, polyester, 2K urethane and 1K primer.